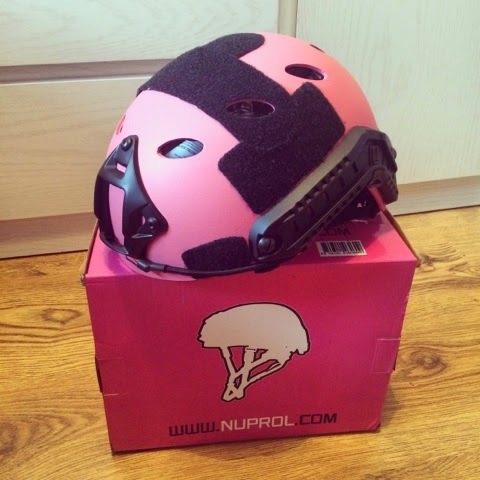 WE Europe Nuprol FAST Railed Helmet in Pink Review! Hey everyone! Those of you that follow me on Instagram and Facebook will know that Nuprol kindly sent me a Pink FAST helmet, and on Sunday the 15th I finally got chance to wear it in a skirmish so I thought I'd do a quick review of it! I wore it to Black Hawk Down Filmsim at Tac House. I've been a fan of the Nuprol FAST helmets since an Airsoft shop 'ordered' me a Viper tactical helmet and when it arrived it turned out to be the Nuprol FAST helmet in black, as this particular helmet was a lot more reasonable in price I decided to take it anyway, and I'm really glad I did. 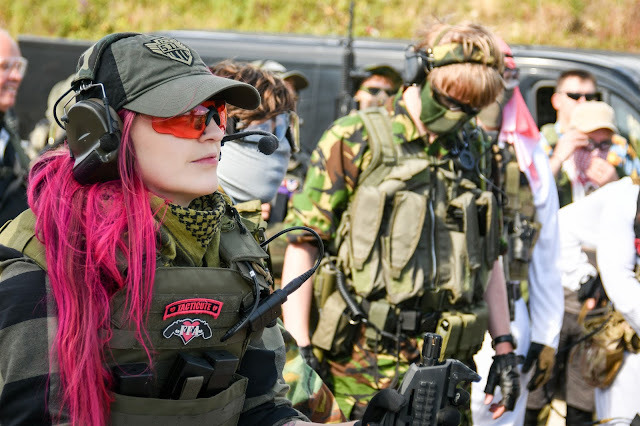 I've had the black Tactical helmet since around November last year and have been really impressed with it, so having it in pink to match my pink accessories is pretty cool. Let's talk about the features and pros! It's shell is made of polymer so is perfect for protecting your head against BB impacts and if you were unlucky enough to bang your head against a wall or the floor if you fell! It has 20mm rails on each side to attach cameras, torches and other accessories - on mine I have a personal lighting system which I use for map/list reading in dark rooms. It is completely adjustable with removable padding, an adjustable neck strap and adjustable back of head restraint so it is perfect for people who have quite small heads like myself. It has a load of Velcro points for you to put all your favourite patches, I usually rock my R2D2 'They see me rollin'' patch haha! And my favourite feature is the mock NVG/accessory plate which I mount my GoPro on. It's priced at £54.99 which is really reasonable, and it does come in other colours if you don't fancy pink one! Yesterday mine protected my head from headbutting a few water boxes and getting pinged by BBs! It's really easy to adjust, comfortable to wear and attach all my bits and bobs! The only downside to having this helmet in pink I would say is that it makes you stand out like a sore thumb. But let's be honest, sometimes it's a little more fun to give them something to shoot at! Haha! I personally love it, it's reasonably priced, tacticute and provides all the protection of its more sombre coloured counterparts just with an added fun twist.